Remove cluster lid a. Refer to ip-19, "removal and installation". Remove the screws from the combination meter. Disconnect the combination meter harness connector and remove. Do not touch the display, pointer, the inside of front cover and the printed area of the dial during the work. Keep away from magnetic sources. Release the pawls and remove the front cover. 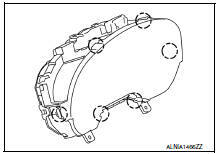 For removal and installation of the steering switch, refer to AV-62, "Removal and Installation". 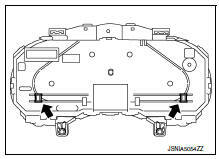 For removal and installation of the illumination control switch refer to inl-57, "removal and installation".